The storm surge could reach a deadly 12 feet. Storm surge poses a deadly threat as "monstrous" Hurricane Michael barrels toward the Florida Panhandle. 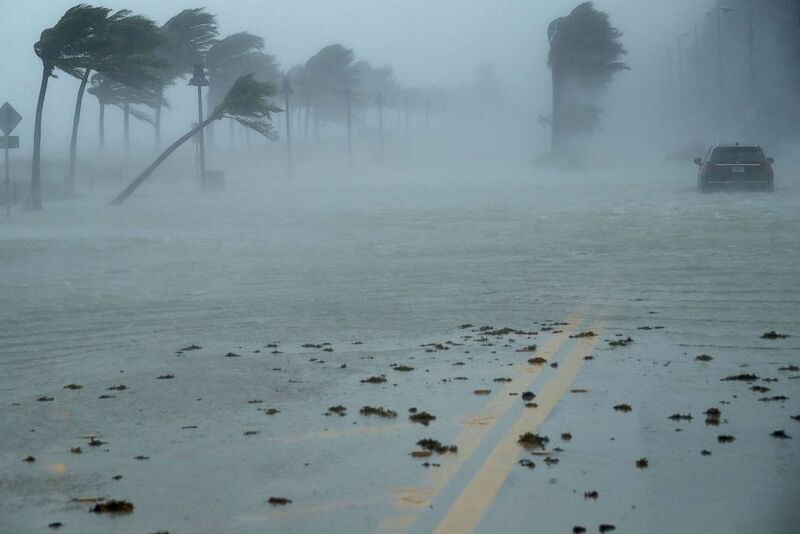 "We haven't seen anything like this in the Panhandle in decades," Florida Gov. Rick Scott said Tuesday. Michael, now a Category 2 storm with winds of 100 mph, is forecast to be a Category 3 storm when it makes landfall near Panama City around 1 p.m. Wednesday. The storm surge could reach a deadly 12 feet, Scott warned. "You cannot hide from storm surge," Scott said at a news conference Tuesday. "Every family must be prepared now ... we can rebuild your house, but we cannot rebuild your life." (Chip Somodevilla/Getty Images, FILE) In this file photo, a car sits abandoned in storm surge along North Fort Lauderdale Beach Boulevard as Hurricane Irma hits the southern part of the state, Sept. 10, 2017, in Fort Lauderdale, Fla.
During Hurricane Katrina in 2005, at least 1,500 people died "directly, or indirectly, as a result of storm surge," the National Hurricane Center said. But what is storm surge? 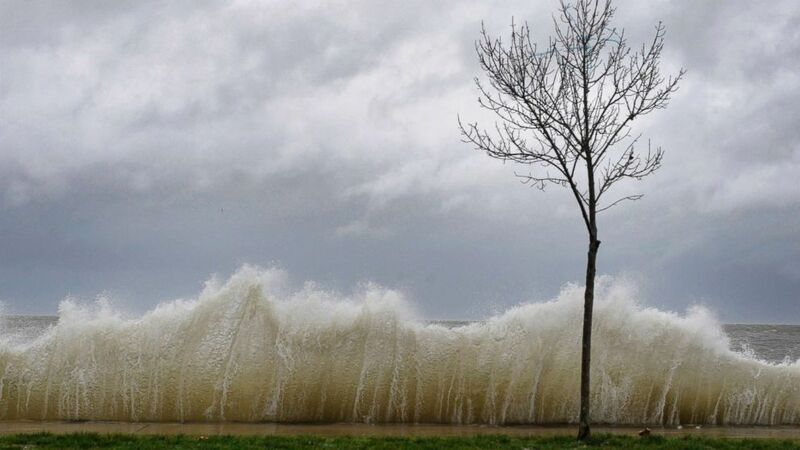 (Jessica Hill/AP, FILE) In this file photo, storm surge hits a small tree as winds from Hurricane Sandy reach Seaside Park in Bridgeport, Conn., Oct. 29, 2012. As pressure falls in the hurricane's center, water levels rise. The water accumulates while the storm is still over the open ocean. When the hurricane closes in on land, its strong winds push that water toward the coast and up onto land, creating walls of water sometimes as high as 20 feet. 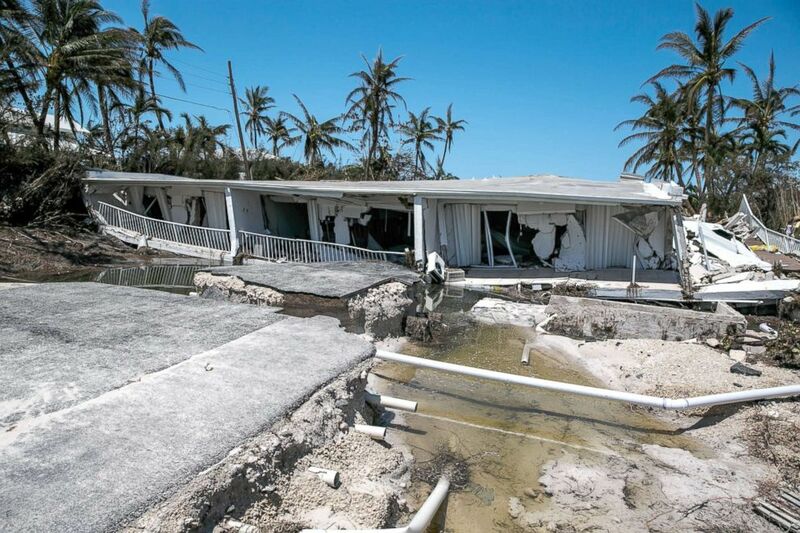 (Marcus Yam/Los Angeles Times via Getty Images, FILE) In this file photo, a 3-story condominium has collapsed after Hurricane Irma send a storm surge and eroded the building foundations, in Islamorada, Florida Keys, Sept. 12, 2017. The danger to people inside houses on the coast is the vicious deluge of water that can flood homes and climb up walls rapidly. When Hurricane Sandy hit New York and New Jersey in 2012, many homes filled quickly with water reaching eight to nine feet. The risks can be even greater if storm surge combines with high tide, creating a devastating, rapid rise in water levels.